Stepping into Bold Park was quite an assault on the senses. An incredibly pleasant assault, I might add. It’s just seven kilometres from the centre of Perth, but this huge, 437 hectare, A-class protected reserve would have you believing you were in the remote bush. 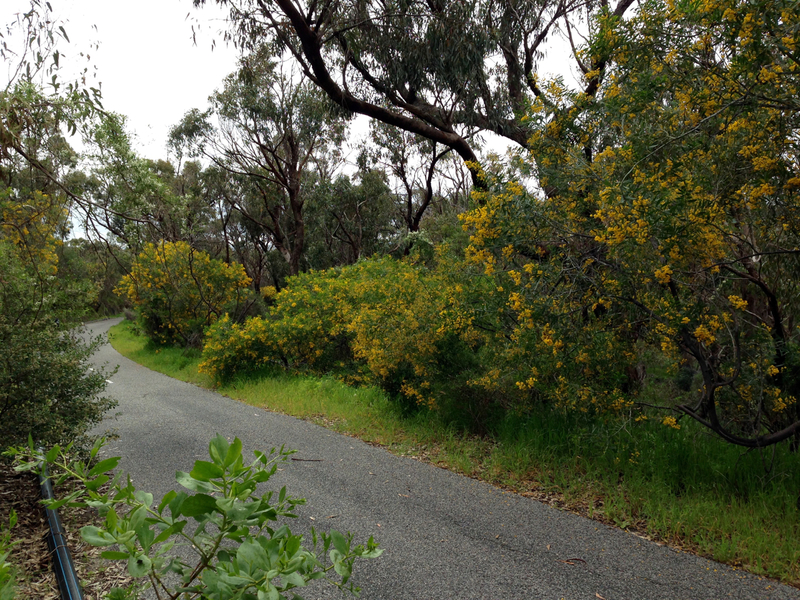 This could have been a little English, country lane….oh, except for the overpowering scent of Acacia! The scent of Acacia, so strong in late August; Freesia (although from South Africa) popping up to provide equally strong, equally delightful smells. And with vast quantities of flowers in full bloom, the sound of bees was absurdly loud, only surpassed by Australia’s not exactly shy, retiring bird population. 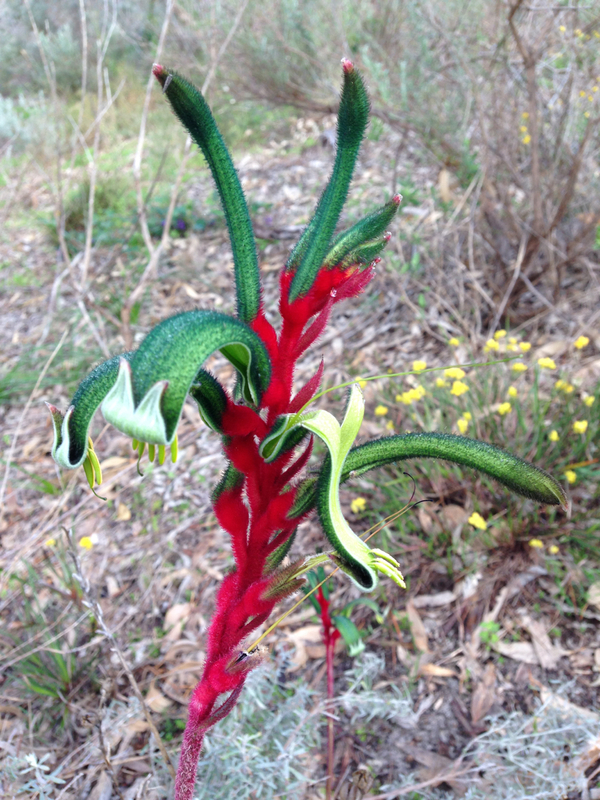 The very first wild kangaroo paw I saw, Anigozanthos manglesii. Can this really be wild? The park, named after William Bold, a town clerk of some 44 years, has some fabulous history, too. Camel Lake was named after it’s role as a quarantine site for these animals during the gold-rush–you can still see tethering marks on some of the trees– and as Perth started to develop, it was an important site for aboriginal camps for many years. Such diversity of plants in Bold Park provided amazing contrasts of colour, texture and form. Note the Zamia (cycads) the trail was named after. Again, this is hard to believe it wasn’t planted. 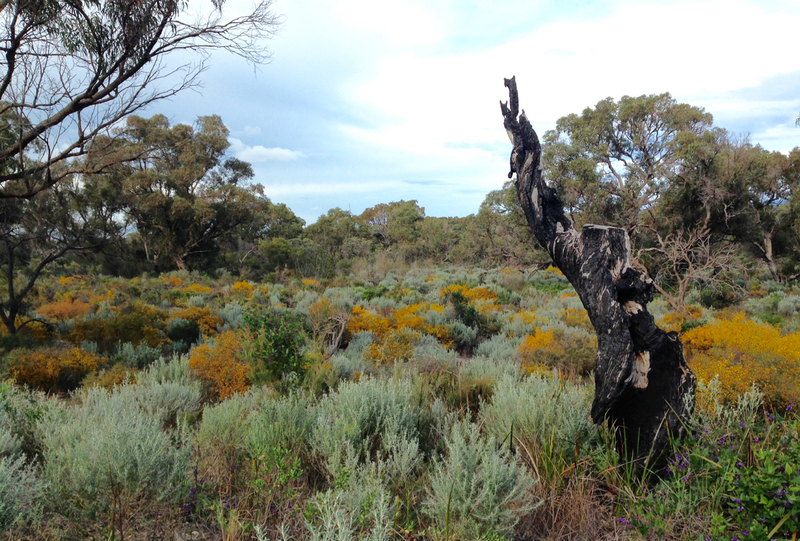 The habitat is mostly tuart-banksia woodlands with some limestone heaths. Those are the technical terms, in any case. To Paul and I, it seemed incredibly diverse; each corner of the five kilometre Zamia trail revealing quite unique mixes of flora. In fact, some 310 local, indigenous plants have been recorded, not to mention the 28 reptiles (fortunately Paul didn’t accidentally step on any large snakes on this occasion; it has been known! ), 91 birds and a whopping 479 types of macrofungi. So does this tell us anything about gardening? Running postman (Kennedia prostrata) in Bold Park. Just look at that sandy soil! There were a couple of things that struck me. One was the miracle of how very attractive plants can grow in what looks like beach sand, with zero irrigation. My sister lives in Dubai and grows amazing tropical plants in her beach sand, but her irrigation runs something like three times a day. 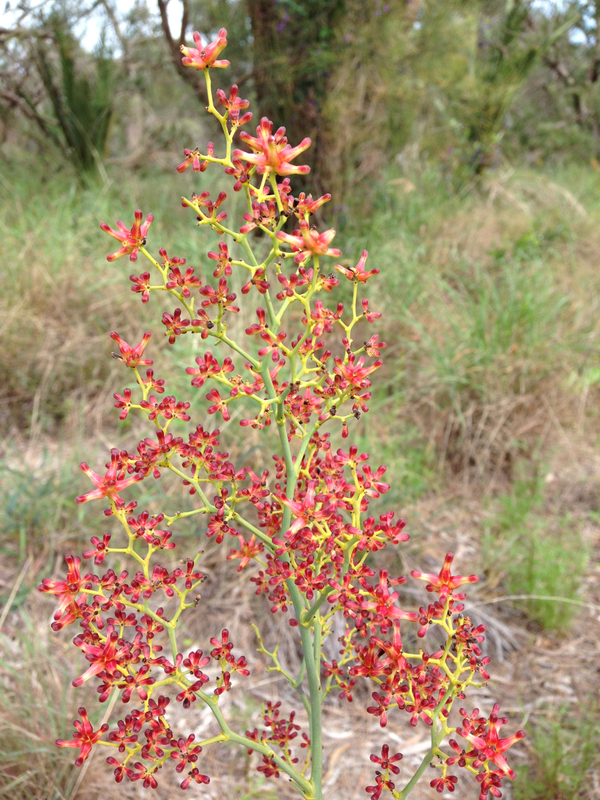 In WA, these plants might go a month without a drop. It’s very encouraging and just goes to show the value of right plant, right place. The second thing was how much we can learn from nature about planting combinations. My friend, Dorothy, recently sent me an article that talks about ‘heightened naturalism’ as a garden style, referring to New York’s High Line, and this sums up exactly how I like to garden myself. Take the best bits from nature and make them even more intense. So whilst we might not want some of the more ‘dishevelled’ aspects of the bush in our gardens, there are still many clues we can find, adapt and borrow. 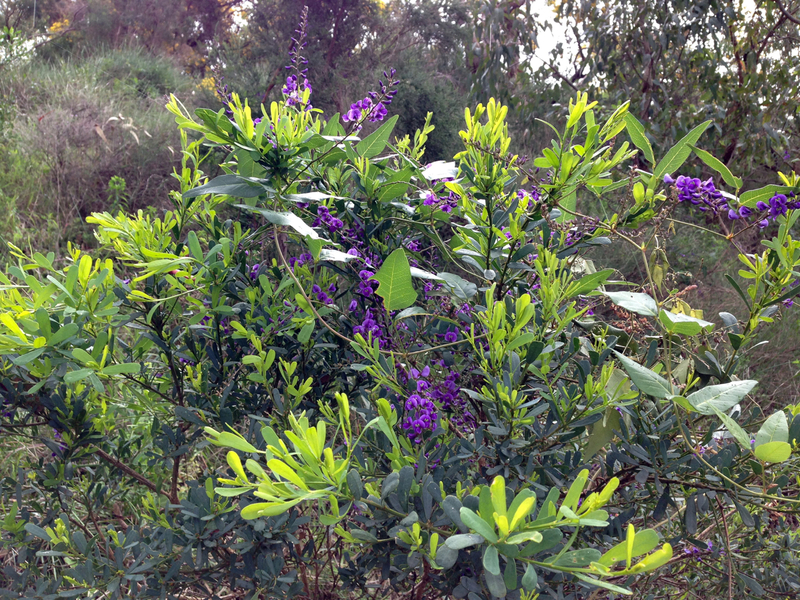 I was struck by how beautiful the Hardenbergia was, growing through all sorts of trees and shrubs. 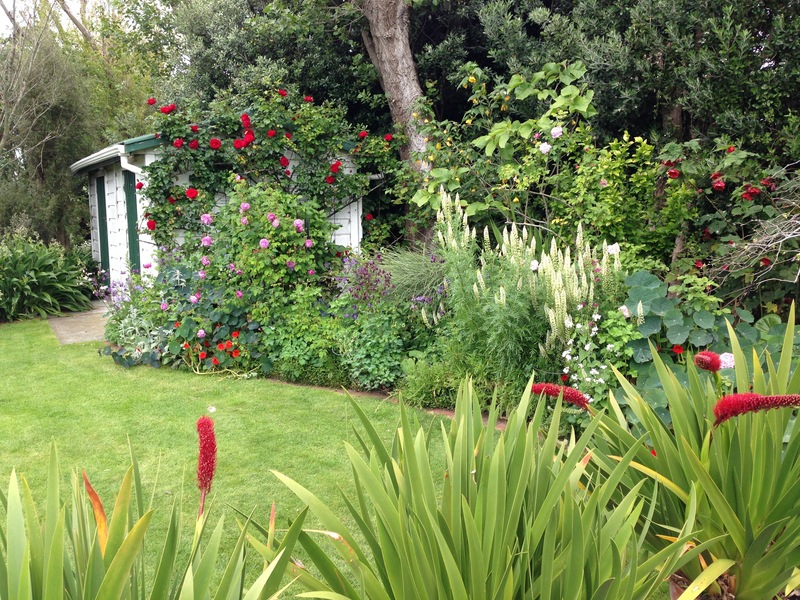 I’m not so keen on that classic English look of purple Clematis scrambling up through hot pink roses. It all looks too false, too brash, too trying too hard, to me. But I love the mix of purple with cream Banksia or this beautiful limey new growth. It reminds me of my friend Katherine’s garden, where she has white potato vine scrambling up through a large Viburnum. I spent hours studying the flower and the leaf through the dining room window, whilst enjoying a delicious, long lunch, embarrassed and frustrated that I had absolutely no idea what this huge plant was; until I finally realised there were two! Nature is so good at showing us more subtle combinations like these. I also loved this glimpse of Stirlingia amongst the grasses. 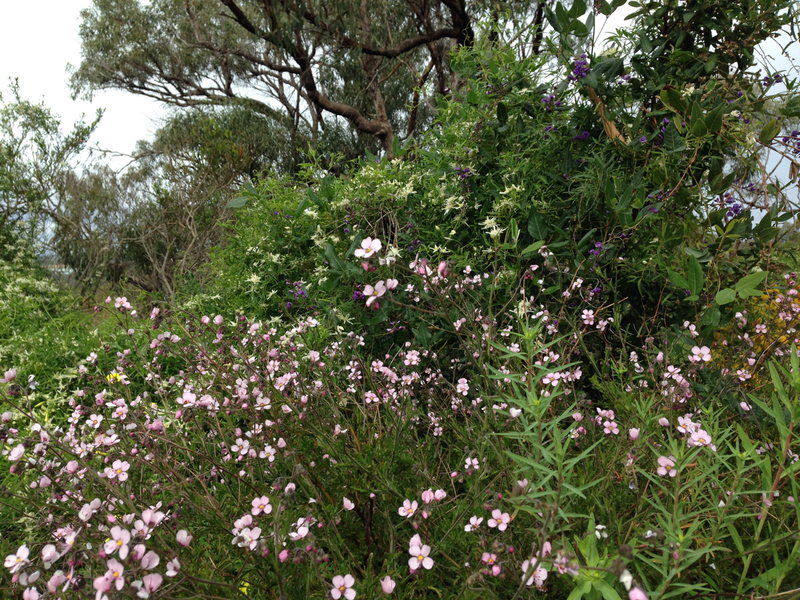 A very subtle, soft and beautiful Australian meadow! 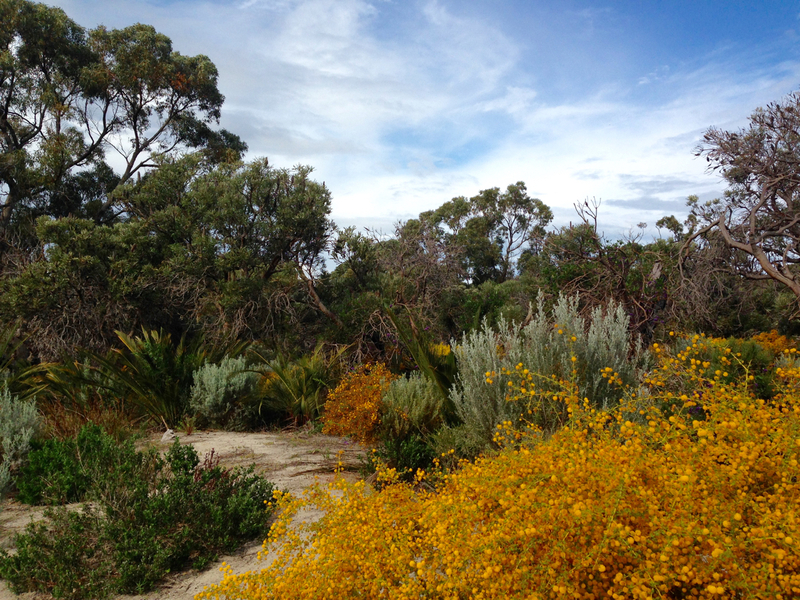 The combination of greens, yellows and a touch of orange is quite stunning, to my eye. And whilst perhaps I wouldn’t choose this at home, the effect of these heathland colours were quite something. I would never think to combine pale minty green with burnt yellow, but en masse, with a touch of dark green thrown in, it really was stunning. 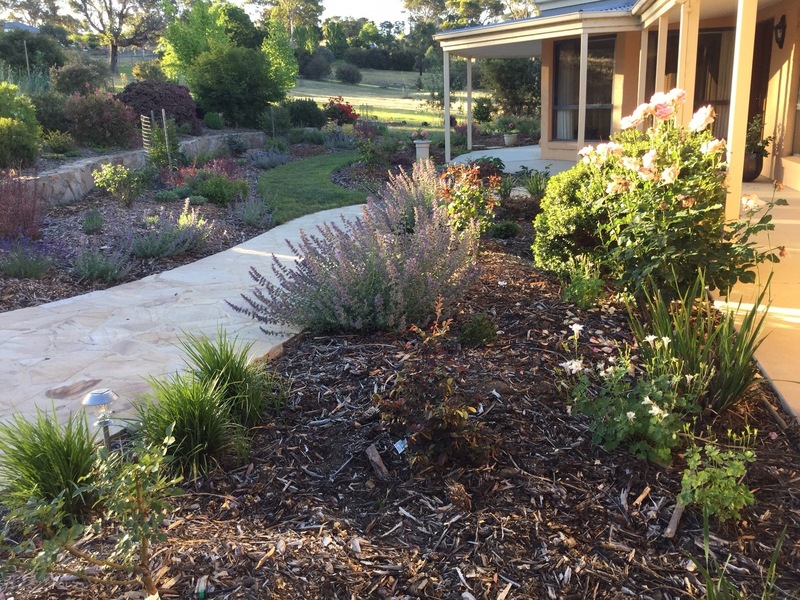 Finally, if I ever get caught in the trap of thinking that arid native gardens can only exist with classic, harsh, saltbush-like colourings, Bold Park offered up some fantastic examples to the contrary. We saw lovely soft pinks and creams along one stretch, replaced by brights in the extreme in another. If you put your mind to it, you can have any colour you want. Who said natives weren’t colourful? 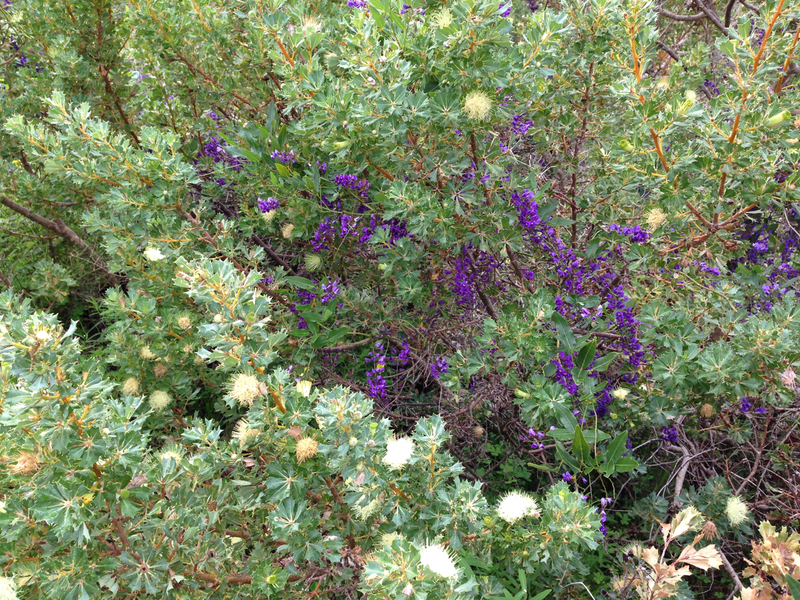 Acacia, Hardenbergia and Templetonia combine effortlessly and naturally in Bold Park. I hope these pictures inspire you a little about the delights of natives and of ‘heightened naturalism’. If they don’t, please bear with me; just wait until we get to Kings Park! Oh Janna! So many treasures!! 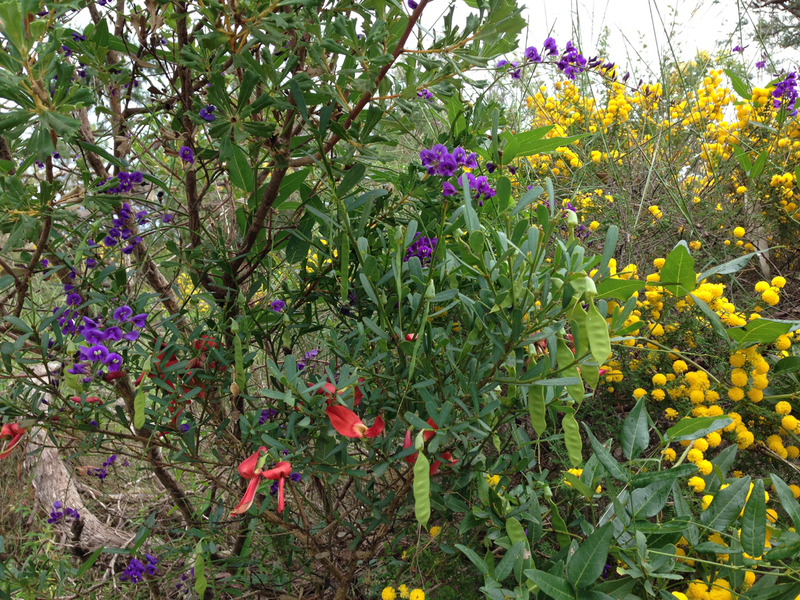 Thank you for illustrating the wonderful diversity of plant life in the Southern Hemisphere. Thanks, Dan. I’m so glad you appreciate our plant life; it is an acquired taste for many. A definite sign of a true plantsman, I think! 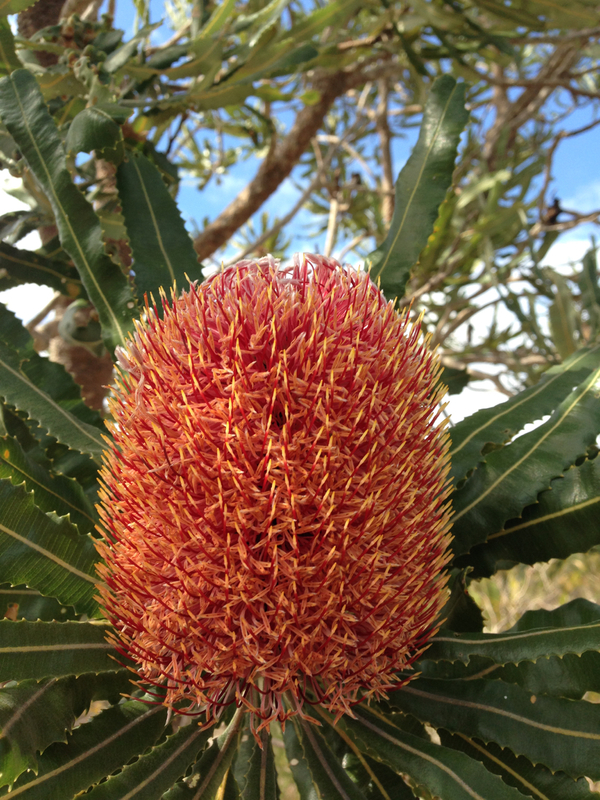 WA, and indeed Australia, certainly is blessed with amazing flora. I’m enjoying seeing the bush through your blogger eyes. As a volunteer bush carer I often only see the weeds! Thanks Janna for refreshing my view. 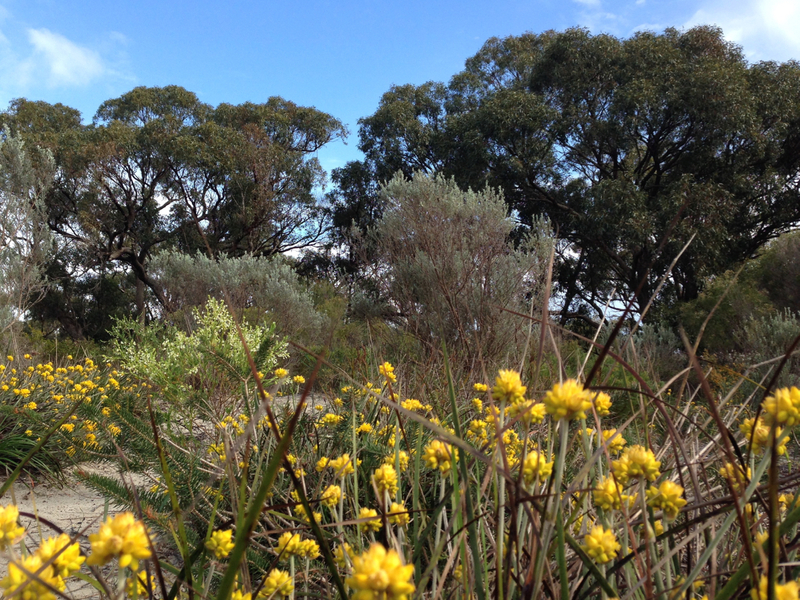 Thank goodness we have volunteers who help look after our precious bushland. I’m very lucky that I am able to just turn up in WA and enjoy it! Stunning Janna – the Hardenbergia comptiana is lovely and not the one we most commonly see in here in the east i.e. H. violaceae. 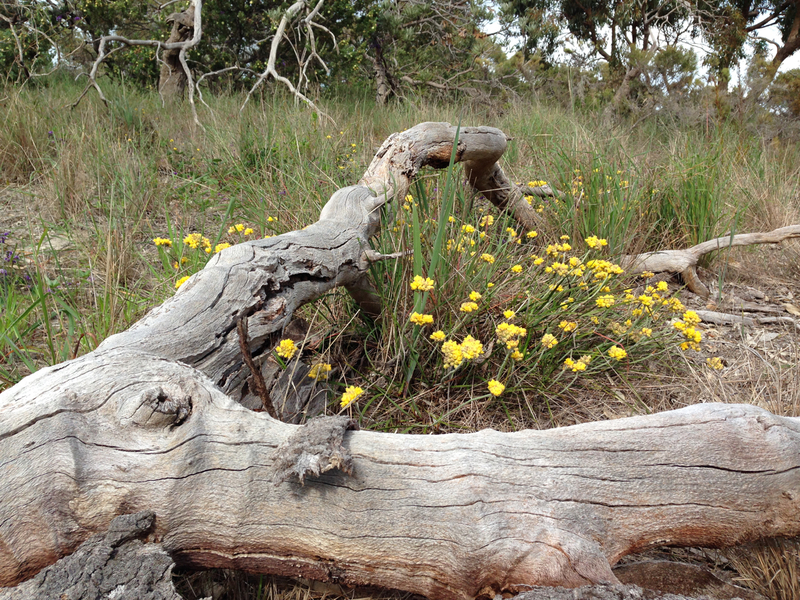 I have always loved this WA species – doesn’t it look great with the yellow (an obvious choice) but nature is very clever too,left to its own devices. Pity about the Freesias you mention as they of course are environmental weeds in many parts of Australia (hopefully they will be removed one way or the other before they take over). The size of this ‘park’ it also amazing! Oh, but the Freesia did smell so nice. I always used to buy them for the first home I bought; a one bedroom flat. The entire place would smell divine for a good two weeks. It brought back happy memories for me, even if it ‘shouldn’t’ really be there. The flora of WA is always so amazing. The wildflowers and meadows that they have are just spectacular! They are indeed spectacular and definitely very showy. However, I got to enjoy some magnificent NSW wildflowers today and I have to say, whilst they are very different, they are equally stunning in their own way. It was great to do the comparison side by side (well, within the space of a week) and find that I couldn’t pick a ‘winner’. I even saw some Telopea from your neck of the woods! 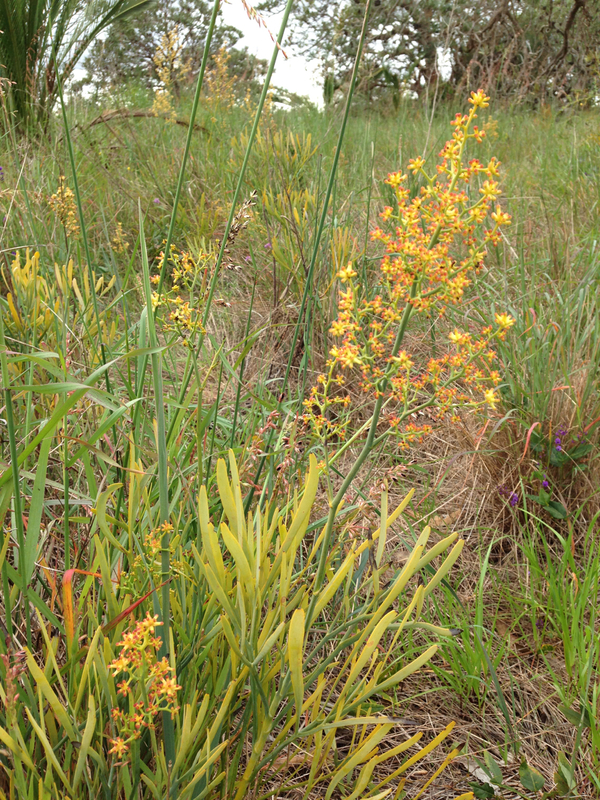 I love them too, but you start to realise how thuggish these garden escapees are when you see them in such profligate numbers within sensitive even remote environments such as this——if we allow them to flourish they would soon take and we would lose native species such as ground orchids for example as freesias’ bulbs swallow up ground space. 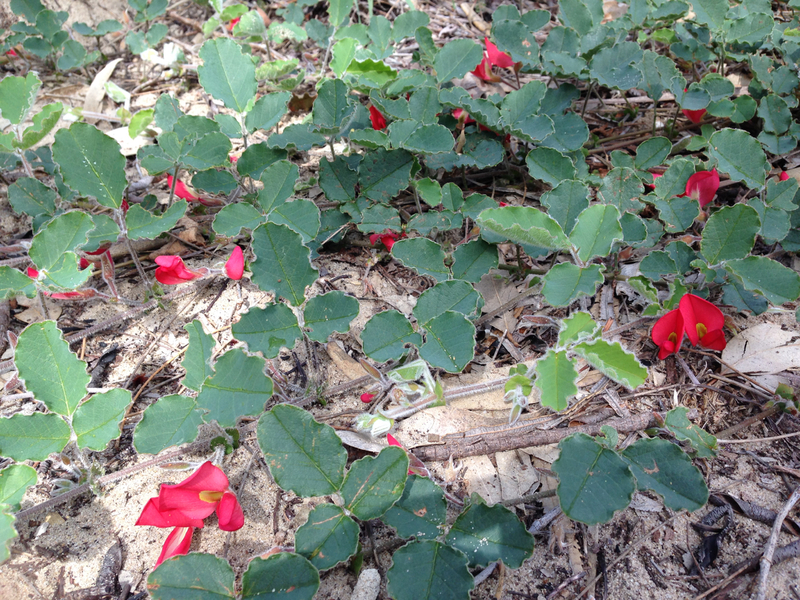 I have seen this in the Dandenongs where the sheer diversity of garden plants turned aggressive environmental weeds is staggering – ranging from bulbs such as freesias, through to the ubiquitous agapanthus and to shrubs such as cotoneaster and holly and trees such as Canadian maples. I am not a natives only person by a long shot either. Yes, this shows my inexperience in this area; it doesn’t seem to be quite the same scale of problem in the UK and I have only ever lived in inner cities in Australia. Interestingly, there were huge numbers of lavender escapees up in the hills and I did look at them and, despite being quite subtle, definitely felt they detracted rather than added to the scenery. I recognised this as quite a turning point for me. They actually quite suit the neighbouring vegetation, but still I just didn’t feel they were right. I’m sure I’ll be with you on Freesia before too long! I know Janna exactly what you mean! It is not my beloved Lavandula angustifolia (English lavender) that is the problem thank goodness but L stoechas. You do see your name! Thanks again for the excellent article. You must, must go to a garden centre in Dubai. The one I’ve been to is amazing. Great quality plants, unbelievable prices and the most helpful staff who load up your trolley and your car for you. All that and it’s like being a kid in a sweet shop with all those terribly exotic plants to choose from! Can’t wait to hear all about it. 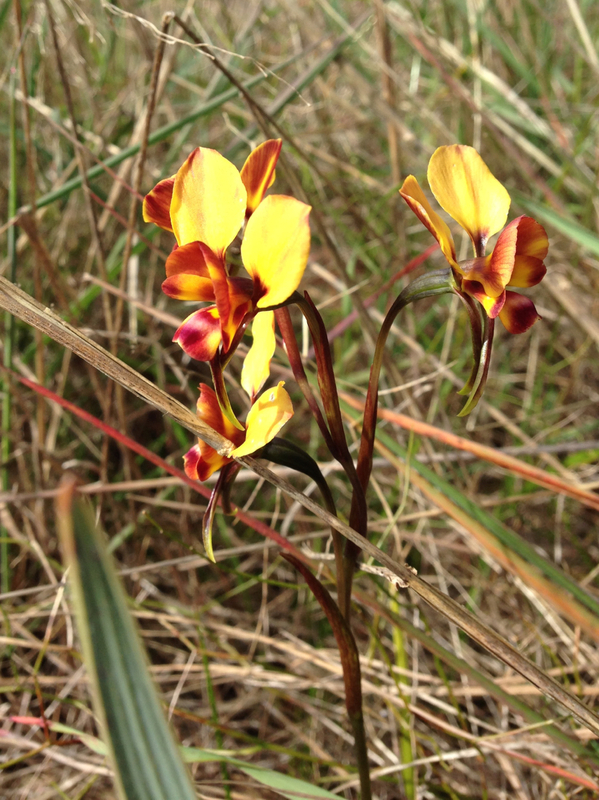 There is something very special about seeing flowers growing in the wild, isn’t there? How do you get to go to all these gardens? Are they open to the public? I love them all. There are so many amazing places in the world, aren’t there? You just need to work out where they are all! Almost all of the places I go to are open to the public. This one here is open and free to the public, 365 days a year. Some are more limited and only open a few days a year but you can tell I am dedicated to planning and getting there when they are! Glad you enjoy seeing the photos, even if you are far away.